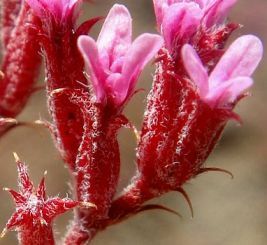 Three Chorizanthe species in southern California are quite similar, usually distinguished only by characteristics that are not often visible in typical photographs. Table 1 lists the three species and gives their distinguishing characteristics. The name of some characteristics in Table 1 are linked to figures illustrating them. Photographs of many of the characteristics given in Table 1, along with other characteristics of the species are shown in the following section. Characteristics in bold are unique to a given species. One should be a bit suspicious of the ends of the numeric ranges in Table 1, since there are magic dividing lines at values such as 4 mm and 4.5 mm that supposedly separate the species. It is extremely unlikely that the species separate so cleanly, and it is unlikely that all the ends of the ranges are either integers or half-integers. In fact, Reveal (1989) says that at the extremes of both species [C. leptotheca and C. staticoides] the measurements overlap. 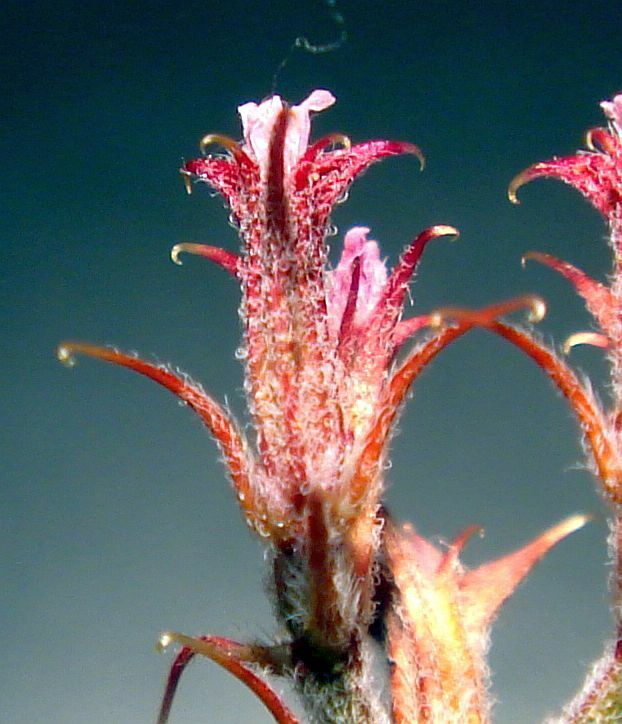 Jane Strong first noticed that the pollen color could sometimes help distinguish these species. The characteristics of the lower bracts are the primary distinguishing feature to separate C. xanti from the other two species. Fig. 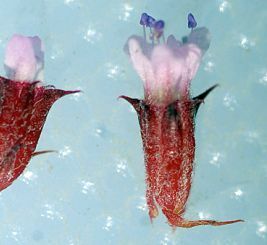 1 shows its leaf-like lower bracts compared to the much-reduced bracts of the other two species. Fig. 1. The much-reduced lower bracts for C. leptotheca (left) compared to the persistent leaf-like lower bracts for C. xanti (right). Click on the pictures for larger versions. Photo on the left was taken by Tom Chester on 26 May 2012 in the Kenworthy Area of Garner Valley, San Jacinto Mountains. Photo on the right was taken by Keir Morse at Cabazon in the Banning Pass Area (between Riverside and Palm Springs) on 26 April 2012. 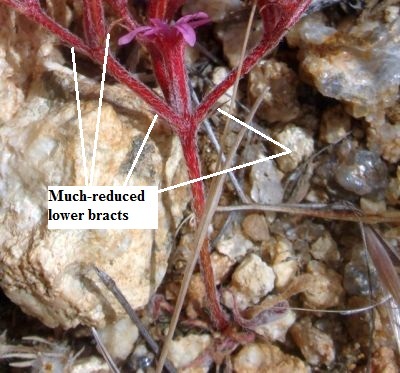 This separation might not be 100% reliable since Reveal says that plants of C. leptotheca can occasionally have persistent leaf-like lower bracts. Furthermore, not all plants of C. xanti have as many leaf-like bracts as shown in the plant in Fig. 1. 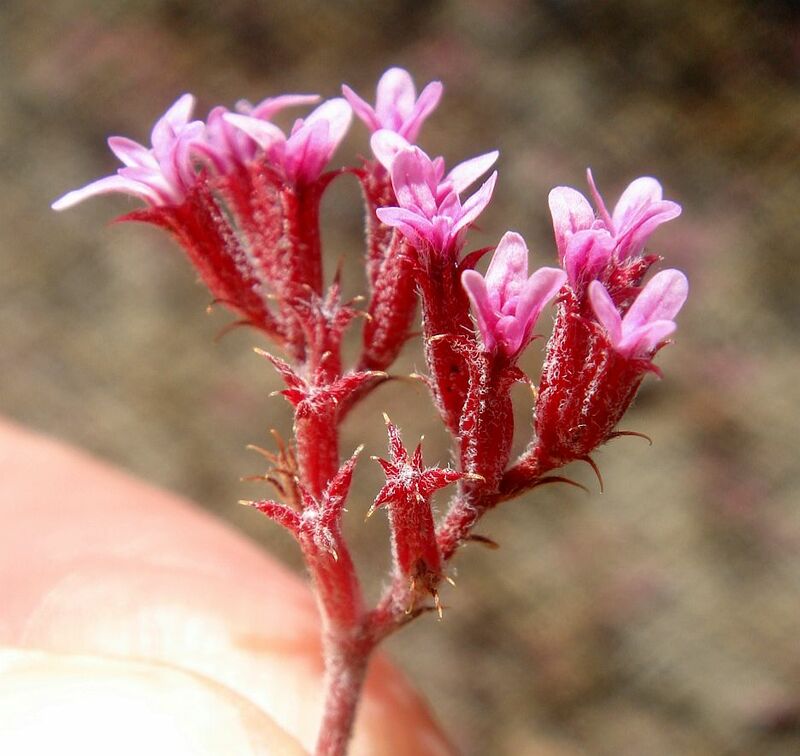 I've seen one plant of C. xanti that has a single leaf-like bract at the lowest node, accompanied by a reduced bract. Many plants of C. staticoides have involucres much more densely clustered than the other two species. However, this isn't always the case; some plants of C. staticoides have involucres clustered about the same as in some plants of the other two species. Fig. 2 shows plants from the same C. staticoides population with both extremes. Fig. 2. 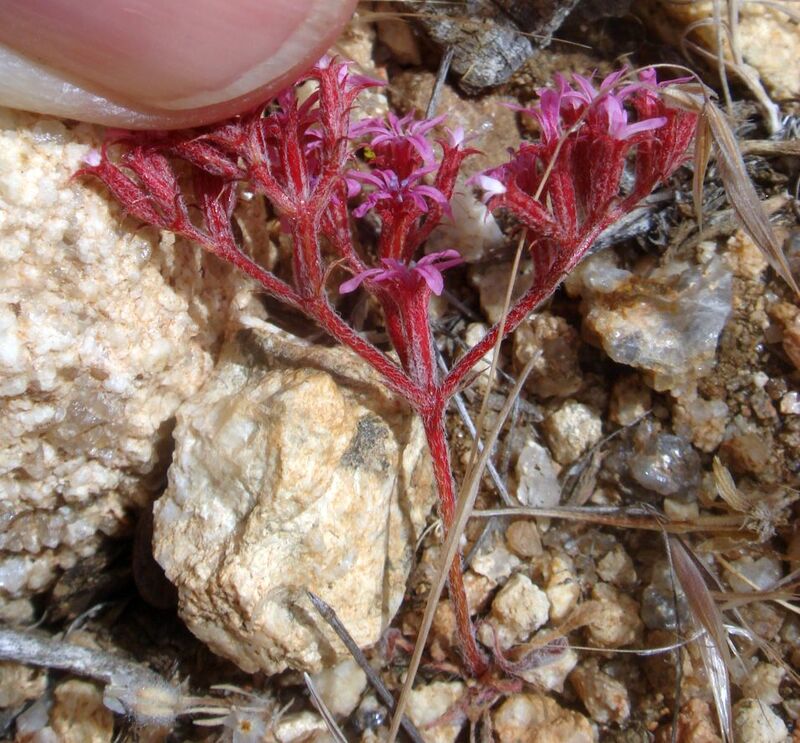 Two plants of C. staticoides from Iron Mountain near Poway, San Diego County that show different degrees of clustering for the involucres. Left: densely-clustered involucres found only in C. staticoides. 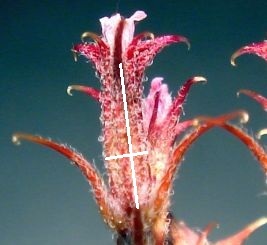 Right: less densely-clustered involucres that are similar in clustering density to some plants of the other two species. Photographs taken by Keir Morse on 25 May 2013. Click on the pictures for larger versions. Goodman's 1934 monograph on Chorizanthe states that the solitary involucres in the lower axils have a different shape that the involucres at the tips of the branches, and hence only the ultimate involucres should be examined for their shape. Fig. 3 shows that typical involucres for C. leptotheca and C. xanti are more slender than the typical involucre of C. staticoides. This characteristic is good enough that I was able to spot, at a glance, photographs of "C. staticoides" at Calphotos that were misdetermined. 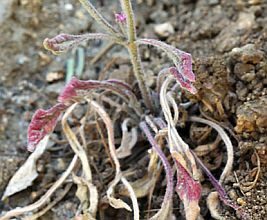 In each case, the misdetermination was then confirmed by the locality of the plant in the photograph. which were all far from the nearest voucher of C. staticoides. Such misdeterminations are fairly common; 12 of the first 24 "C. staticoides" photographs on page 1 (on 22 May 2015) were actually C. leptotheca, and two were probably C. xanti. I've notified all those photographers so that they can change the determinations of their photographs. Fig. 3. View of individual involucres for the four taxa showing the less-slender involucre of C. staticoides. The number below each pictures gives the ratio of the involucre tube width (at its widest point) to the involucre tube length. Those widths (shortest white bars) and lengths (longest white bars) are shown by bars in each photograph. C. leptotheca photo by Tom Chester, from the Kenworthy Area of Garner Valley, San Jacinto Mountains on 26 May 2012. C. staticoides photo by Chris Winchell, from West Cuesta, San Luis Obispo County, on 4 July 2011. C. xanti var. 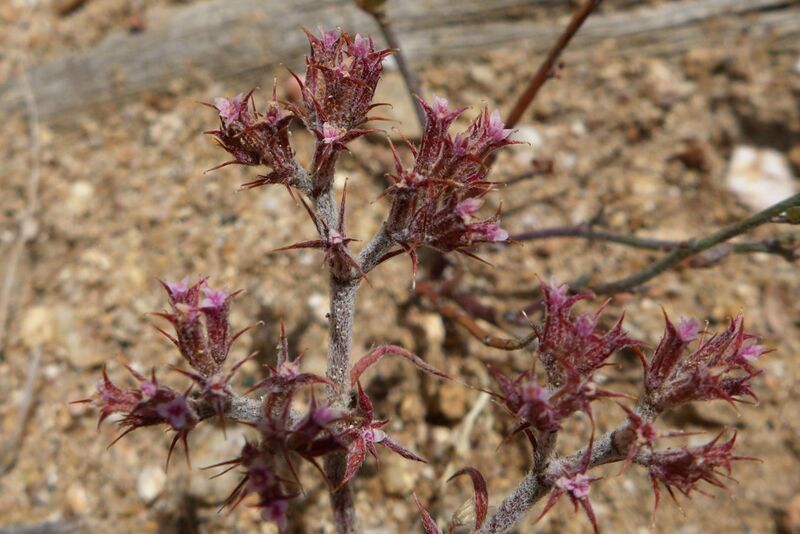 leucotheca photo by Tom Chester, from the Cactus Spring Trail, north side of Santa Rosa Mountains, on 17 May 2015. C. xanti var. xanti photo by Aaron Schusteff from the Greenhorn Mountains, Sequoia National Forest, Kern County, on 31 May 2012. Unfortunately, few photographs show the involucres from the side, and even fewer photographs allow a good numeric measurement. One has to have a photograph with at least one involucre not tilted toward or away from the camera, and isolated enough so that one can measure an individual involucre. C. staticoides: 0.45, 0.50, 0.54, 0.59, 0.60. 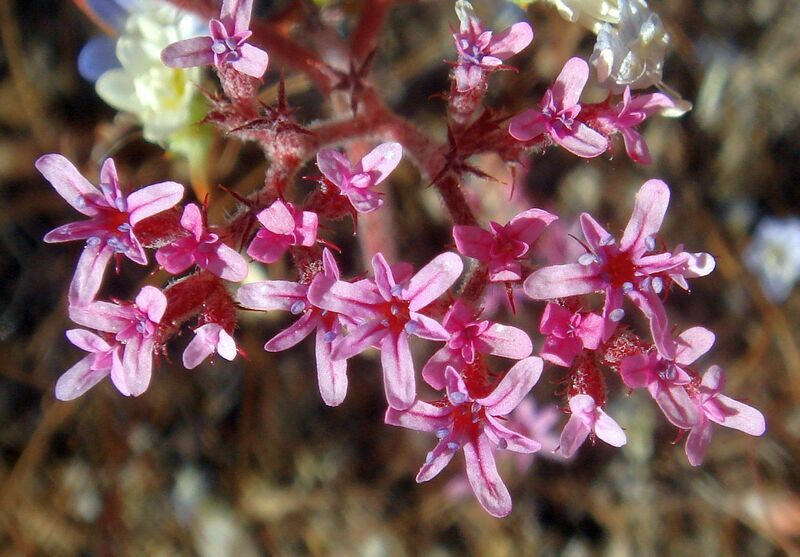 However, that key fails for the uncommon plants of C. leptotheca with persistent leaf-like lower bracts. Reveal states that although C. leptotheca and C. staticoides are clearly related, they are not known to be sympatric (growing together in any location), and implies that C. xanti is not sympatric with either as well. 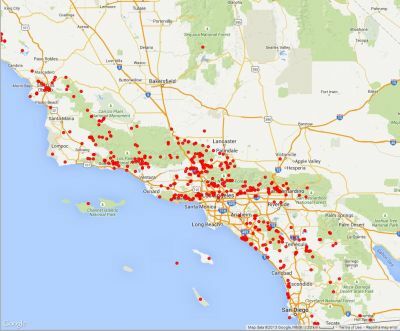 The voucher geographic distribution maps given below show that this mostly seems to be the case. Reveal says in his latest online treatment that all three species are consistently distinguishable morphologically (as long as one has a sample of an entire plant, or a set of plants from the same location, to examine in detail). However, that is not what he said in his monograph; see below. C. xanti has two varieties: var. xanti with involucres "sparsely pubescent", and var. 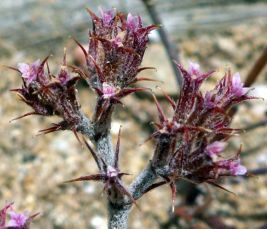 leucotheca with involucres "densely pubescent". These are probably the extremes of a continuous distribution in hairiness. Although vouchers seem to show a sharp demarcation in the geographic distribution of these varieties, some photographs in Fig. 4 show little difference in the involucre hairiness between some plants determined as var. xanti, from the edge of the var. xanti geographic range as far away from the range of var. leucotheca as possible, and some plants determined as var. leucotheca, from the edge of the var. leucotheca range as far away from the range of var. xanti as possible. 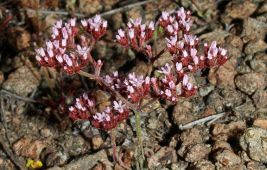 However, an extreme leucotheca plant is so striking that it is clear why one would like to define a variety for it; see Keir Morse's photograph of a plant that is probably the best example of var. leucotheca. See also Reveal's reasoning for defining this as a variety quoted at the bottom of this page. a northern phase, from Monterey County to southern San Luis Obispo County. The type specimen is from this population. Reveal does not mention how this differs from the other forms. 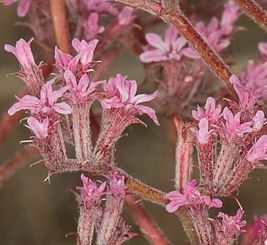 a reddish-stemmed form found in the Transverse Ranges; see photograph from Los Angeles County by Anuja Parikh and Nathan Gale. 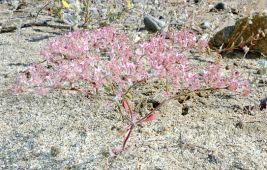 a greenish-stemmed form, with white flowers, mainly in the Santa Monica and San Gabriel Mountains (C. nudicaule); see photograph from Los Angeles County by Anuja Parikh and Nathan Gale. 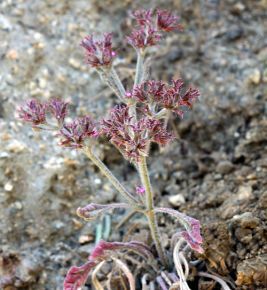 See also an a plant with both greenish and reddish stems by Dave Silverman. 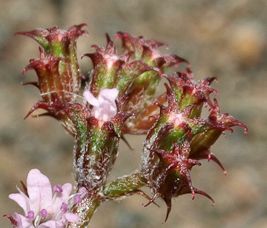 a form that tends to retain its lower foliaceous bracts on the plant longer, from the western population of Ventura and Santa Barbara counties (form bracteata; type locality Red Reef Canyon, Topatopa Mountains, Venture County). 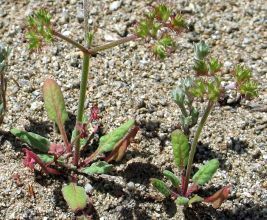 an immediate coastal form in Orange and San Diego counties with longer awns (C. discolor; C. chrysacantha); see photograph from Torrey Pines by Keir Morse. Goodman also defined a form from western San Bernardino and Los Angeles County with shorter awns as var. 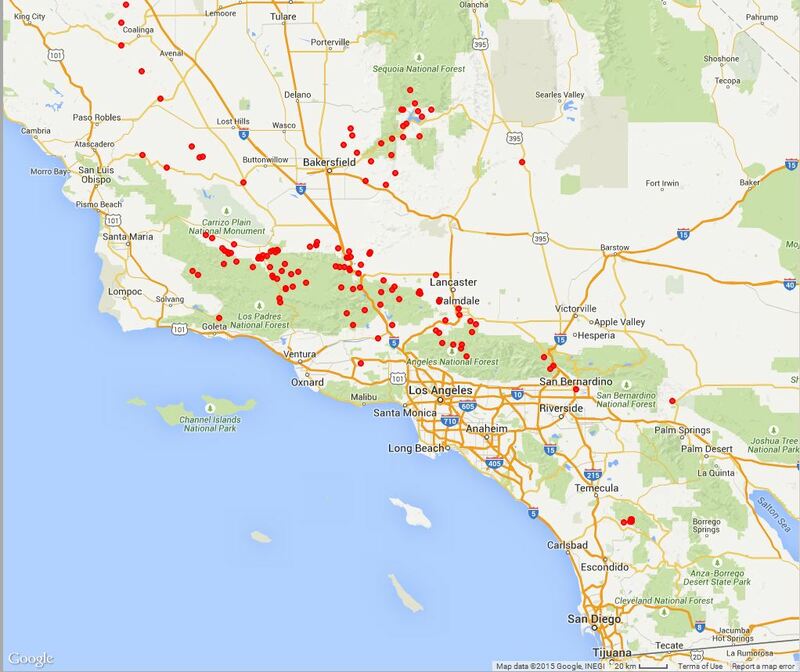 brevispina (type locality near Deer Park, Monrovia Canyon, San Gabriel Mountains). Reveal considered all of these as intergrading forms, and explicitly rejected recognizing any varieties or subspecies in C. staticoides, making future botanists much happier that they didn't have to figure out what variety they collected. Photographs of various characteristics of the four taxa are shown in Fig. 4. Fig. 4. 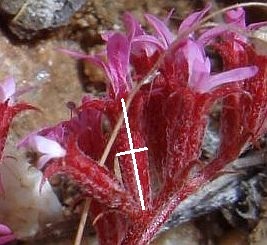 Characteristics of three Chorizanthe species, including the two varieties of C. xanti, as labeled at top and bottom. 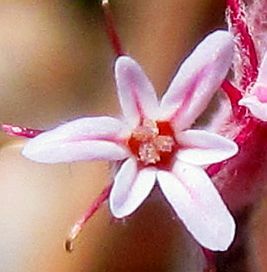 Top row: view of the flower from the front. 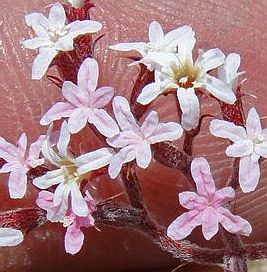 Note some flowers of C. xanti var. 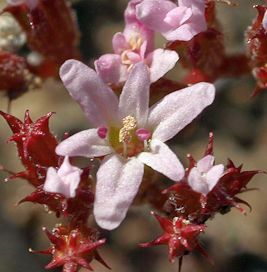 xanti in its photograph have perianth lobes that are similar, and some flowers have inner lobes that are shorter. Second row: view of the involucre from the side. Note that all taxa have a slender involucre compared to the squater involucre of C. staticoides. Third row: view of the clustering habit of the involucres as seen from the side. The involucres of C. staticoides are more densely clustered. Fourth row: view of an entire plant from the side. These photographs do not show the full range of expression for each species, which all can range from erect to spreading. Bottom row: view of the lower bracts and basal leaves. Note the leaf-like bracts of C. xanti at the first stem node. Photo credits: C. leptotheca photos by Tom Chester. Rows 1 to 3 from Strawberry Creek, Idyllwild, San Jacinto Mountains, on 15 July 2011. Rows 4 and 5 from the Kenworthy Area of Garner Valley, San Jacinto Mountains on 26 May 2012. C. staticoides photos. Rows 1, 3 and 4 from Keir Morse, from Monserate Mountain Preserve in Fallbrook, San Diego County, on 21 April 2012. Row 2 from Chris Winchell, from West Cuesta, San Luis Obispo County, on 4 July 2011. Row 5 from Robert Steers, from Lazy W Ranch, Hot Springs Canyon, Santa Ana Mountains, Orange County, on 16 April 2009. C. xanti var. leucotheca photos. Rows 1 to 3 from the Cactus Spring Trail, north side of Santa Rosa Mountains, 17 May 2015. Row 1 by Mike Crouse; rows 2 and 3 by Tom Chester. Rows 4 and 5 by Keir Morse, from Cabazon in the Banning Pass Area (between Riverside and Palm Springs) on 26 April 2012. C. xanti var. leucotheca photos. Rows 1 by Neal Kramer from Comanche Point, Kern County, on 9 May 2011. Rows 2 and 3 by Aaron Schusteff from the Greenhorn Mountains, Sequoia National Forest, Kern County, on 31 May 2012. Rows 4 and 5 by Debra Cook from Rancheria Canyon Rd., Kern County, on 29 April 2015. Fig. 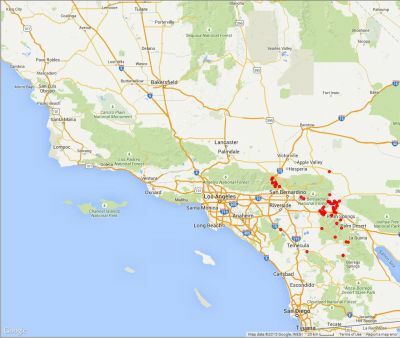 5 shows the geographic distribution of these species using all vouchers at the Consortium of California Herbaria, retrieved on 18 May 2015. Fig. 5. 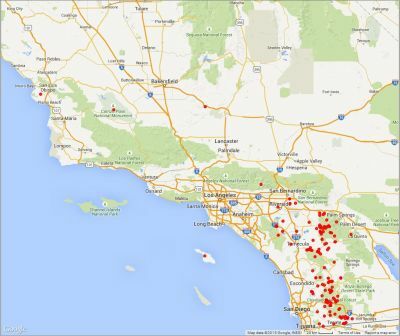 Geographic distribution of four Chorizanthe taxa. Click on the maps to get larger versions. The geographic separation of the taxa seems remarkably distinct, almost too-good-to-be-true. There are hardly any outliers in the maps! 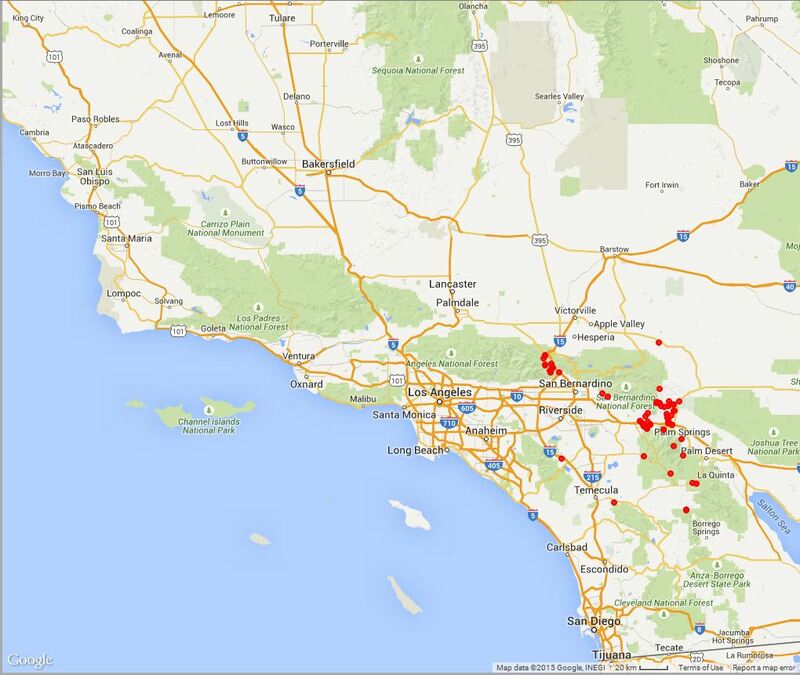 Three outliers of C. leptotheca, one in San Luis Obispo, one in the Carrizo Plain and one in the Tehachapis, seem likely to be misdetermined. The other notable outliers are a handful of vouchers of C. xanti var. xanti from the southwest side of Palomar Mountain, which are way out of range for that taxon and well inside the range of C. leptotheca. 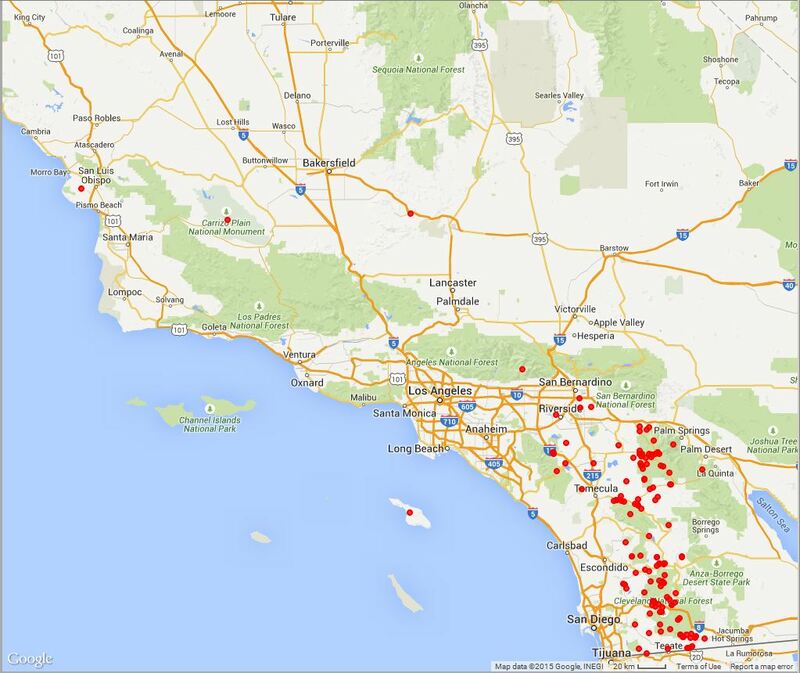 Fortunately, a high resolution scan of the best specimen of those vouchers, from the synoptic collection for San Diego County, is online and can be examined. Although one of the five plants in that synoptic collection voucher from Palomar does have some clear leaf-like persistent lower bracts, the other four plants have only much reduced bracts consistent with C. leptotheca. 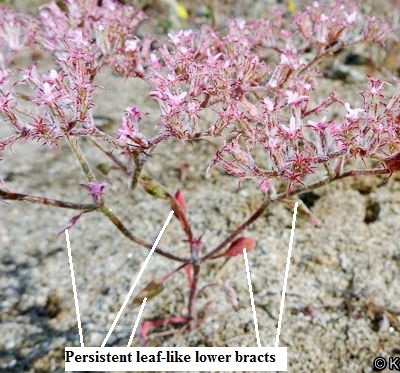 That single plant also looks abnormal in producing that node with the leaf-like bracts, since the other four plants have no node at that position. This set of vouchers determined as C. xanti var. xanti should be reexamined to see how solidly they differ from the surrounding sea of C. leptotheca in fruit size and pollen color. The excellent separation of the varieties of C. xanti seems surprising. For example, the involucres of var. xanti from the Greenhorn Mountains, Sequoia National Forest, Kern County, which is nearly as far away as possible from the voucher distribution of var. 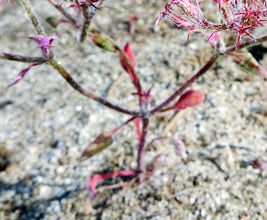 leucotheca, seems identical in hairiness to plants from the north side of the Santa Rosa Mountains, which is nearly as far away as possible from the voucher distribution of var. xanti. 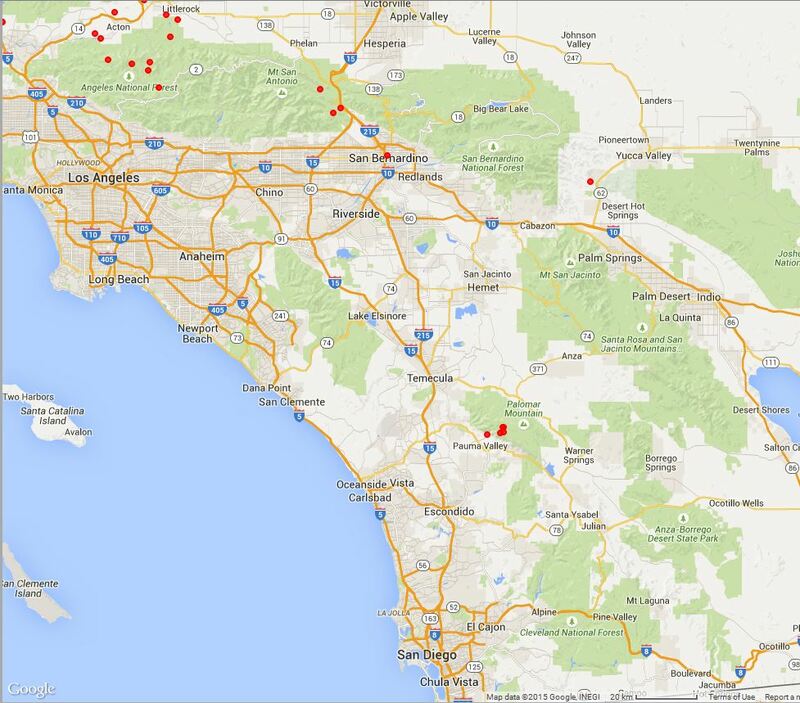 Neither of those involucres look anything like the extremely white-hairy ones from Cabazon. 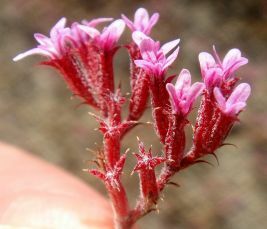 It is probable that the lower bracts in this species [C. leptotheca] are foliaceous but early caducous. C. staticoides is one of the more widely distributed species among the California endemics in the genus, and it is one of the most variable. The Douglas type represents the northern phase and was probably collected in the Santa Lucia Mountains of Monterey Co. That expression extends from that county southward to southern San Luis Obispo Co. 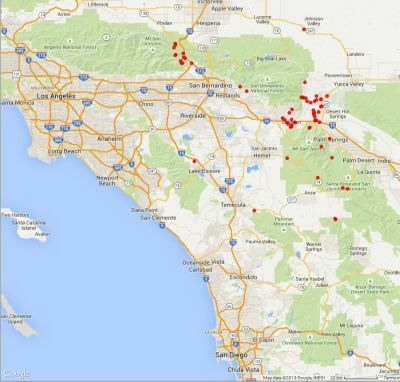 In the Tranverse Ranges are three more or less isolated populations extending from the Santa Ynez Mountains eastwardly to the San Bernardino Mountains. There are also three expressions, but none is restricted to any one of the isolated regions. The reddish stemmed one is the most common (or at least the most commonly collected). It is found throughout the [Transverse Range]. The greenish stemmed one is found mainly in the Santa Monica and San Gabriel Mountains. 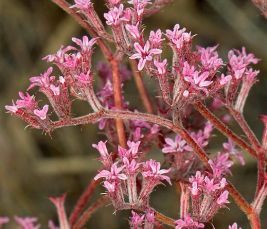 In the western population of Ventura and Santa Barbara cos., some plants tend to have their lower foliaceous bracts remain on the plant longer than elsewhere. The involucres of such plants are somewhat smaller and more corrugate than the norma as well. 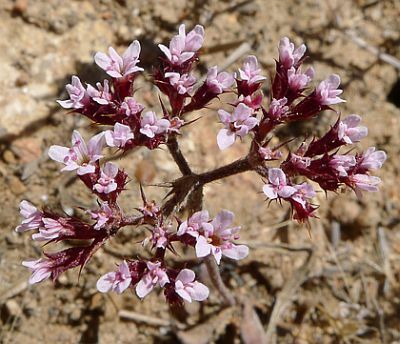 There is an expression infrequently found in the San Gabriel, San Bernardino and Santa Ana Mountains that tends to be rather tall and long-leaved. 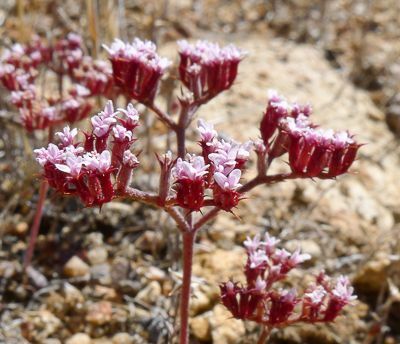 It has typically been collected in areas that had recently burned and probably represents an elongated sun form. All of these expressions fall into a single species, C. staticoides. 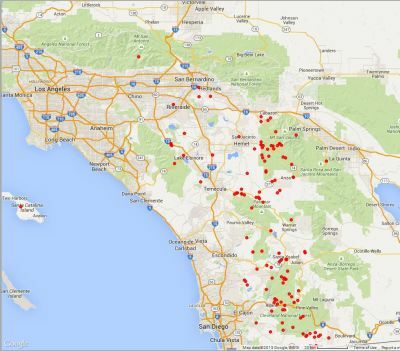 The one expression that is arguably distinguishable is the coastal form that occurs along the immediate coast in Orange and San Diego cos.... The coastal expressions differ from the bulk of C. staticoides to the north and east in having longer awns. None of these features is consistent. C. leptotheca is found to the east of C. staticoides and basically the ranges of the two species do not overlap. 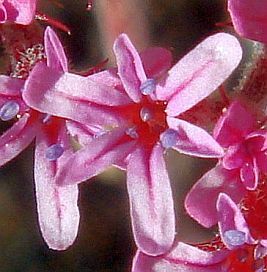 C. leptotheca has a longer flower and a longer and narrower involucre. Also the involucres are not as densely clustered as they are in C. staticoides. 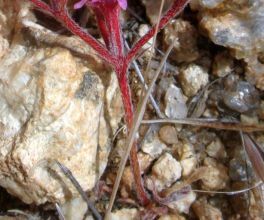 The form of the species found in the southern part of its range is a rather stunted expression on the granitic sands in the chaparral. 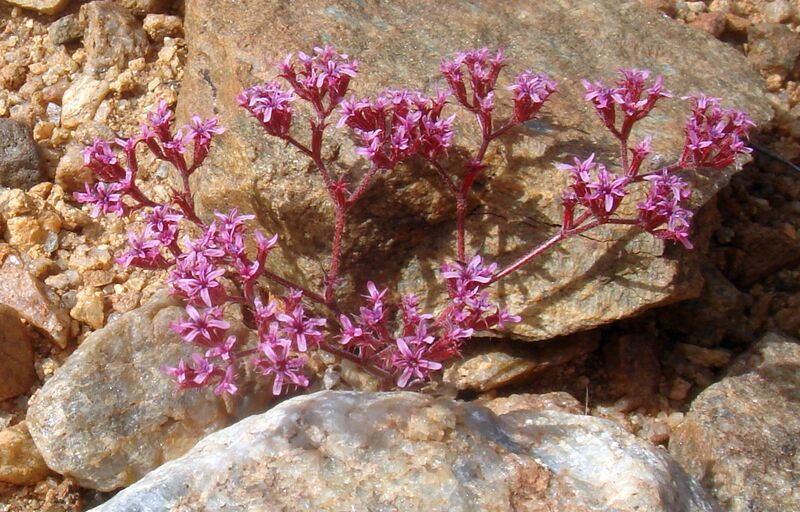 To the north, where the plant is still found mainly on granitic soils, it is taller and more open in the pine forests of the San Jacinto Mountains. 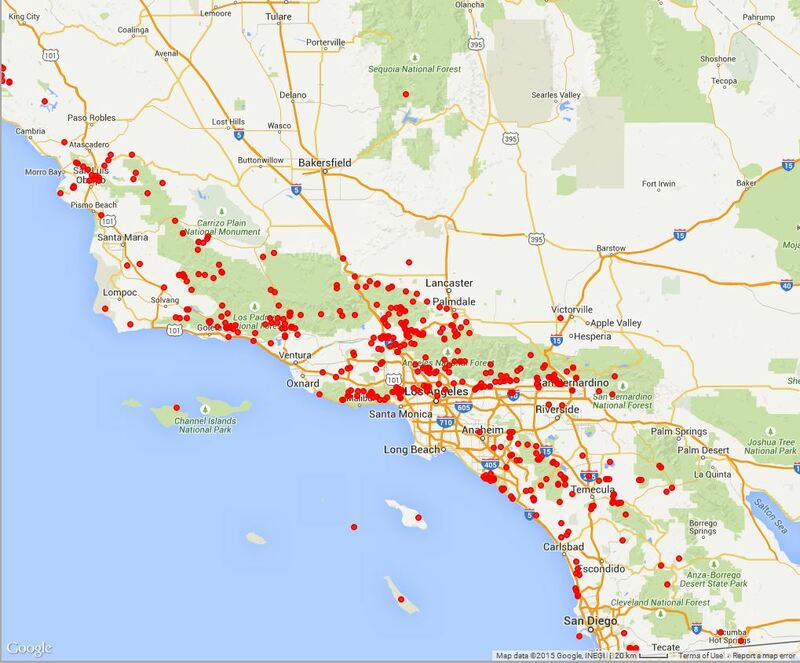 Voucher data provided by the participants of the Consortium of California Herbaria (ucjeps.berkeley.edu/consortium/). I thank Debra Cook, Mike Crouse, Neal Kramer, Keir Morse, Aaron Schusteff, Robert Steers, and Chris Winchell for permission to reproduce their pictures here. Their pictures may not be further reproduced without permission from the photographers. I thank Aaron Schusteff for his illuminating comments on one of his Calphotos pix about the variation in the perianth lobes for C. xanti. I thank James Dillane for bringing the online monograph by Goodman to my attention, that resulted in the addition of the last section of this webpage; Jane Strong for alerting me about the green form of C. staticoides from the Santa Fe Dam area; and Keir Morse for a question that gave me the idea to measure the shape of the involucres.